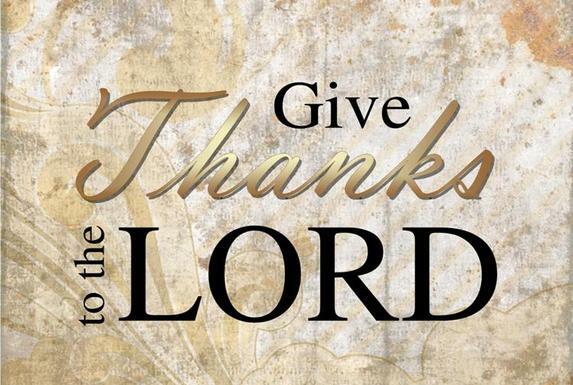 Today is Thanksgiving Day, a day we slow down to give thanks. Yet, I was reminded this morning that I should be giving thanks every day of the year, not just on Thanksgiving. And I try to. I have a Thank You journal by my chair to write down what I’m thankful for each day. It’s easy to thank God when things are going great, when my football team wins, when He answers my prayers the way I wanted, when He surprises me with sweet blessings I wasn’t expecting. But it’s not so easy to give thanks in the middle of a difficult situation when life is overwhelming – caring for an aging parent or sick family member, dealing with a diagnosis you never wanted to hear, financial struggles, marital heartache, a wayward child, death of a loved one much too soon. And yet, God doesn’t tell us to only give thanks when we are happy with what He’s doing. We are to give thanks in all things at all times, not just one day of the year. Today, I will spend Thanksgiving at the nursing home with my 98-year-old mom who may or may not know I’m there. Can I give thanks in this situation? Yes. Is it easy? No, but I can still give thanks, knowing that God is in control and He has a purpose in all He does. What blessings am I thankful for? What brings a smile to my face when I say “thank you”? What hardships or difficulties can I say “thank you” for, even though I may be saying it through tears? Who is someone you are thankful for today? Let them know. Spend some time this Thanksgiving week in quiet reflection. What are you thankful for?